"We are trying to do the best job we can in assessing the quality information about climate change issues in all its dimensions and some do not like the conclusions of our work. Now it is true we made a mistake around the glacier issue, it is one mistake on one issue in a 3,000 page report. We are going to reinforce the procedures to try this does not happen again." So says Jean-Pascal van Ypersele, vice chairman of the IPCC - as retailed by the famous Louise Gray, purveyor extraordinare of WWF press releases – in The Daily Telegraph today. It was simply a "human mistake", he adds. "Aren't mistakes human? Even the IPCC is a human institution and I do not know of any human institution that does not make mistakes, so of course it is a regrettable incident that we published that wrong description of the Himalayan glacier," he says. So far though, the IPCC is sticking to its legend that this is only "one mistake", burying its head firmly in the sand and ignoring the growing evidence that the IPCC report is riddled with "mistakes" – to apply that extremely charitable definition. Another of those "mistakes" is the false claim highlighted in my earlier post on "Amazongate", where the IPCC has grossly exaggerated the effect of climate change on Amazonian forests, stating "up to 40% of the Amazonian forests could react drastically to even a slight reduction in precipitation" – on the basis of a non peer-reviewed WWF report whose lead author, Andy Rowell, is a free-lance journalist. However, being "human" myself – although some would hotly dispute that assertion – I appear to have made a mistake in my analysis, charging that in the document referenced by the IPCC, there is no evidence of a statement to support the IPCC’s claim that "40 per cent" of the Amazon is threatened by climate change." Actually, that is the charge retailed by James Delingpole and by Watts up with that, whereas what I actually wrote was that the assertion attributed to the author of the WWF report, that "up to 40% of the Amazonian forests could react drastically to even a slight reduction in precipitation" is nowhere to be found in the report. That is very much my mistake, having completely missed that passage, thus charging that the IPCC passage was "a fabrication, unsupported even by the reference it gives". D. C. Nepstad, A. Veríssimo, A. Alencar, C. Nobre, E. Lima, P. Lefebvre, P. Schlesinger, C. Potter, P. Mountinho, E. Mendoza, M. Cochrane, V. Brooks, Large-scale Impoverishment of Amazonian Forests by Logging and Fire, Nature, 1999, Vo l 398, 8 April, pp505. Although the article is protected by a pay wall, I have tracked down a free version of the paper here. The paper is published in the "letters to Nature" which, in this magazine, is peer-reviewed (this is not the case with all journals) so the question immediately arises as to why the IPPC authors did not cite the Nature article rather than the secondary reference. 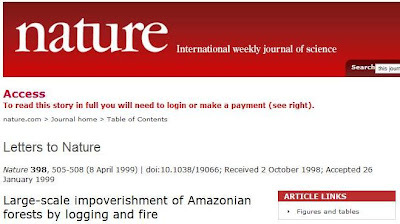 The clue, perhaps, lies in the title of the article, which is, "Large-scale Impoverishment of Amazonian Forests by Logging and Fire" – i.e., it is not about climate change. Delving into the text, we looked for sections of the text which would support the assertion made by Rowell & Moore and then by the IPCC. To remind us of what was written, we reproduced their texts here. Although logging and forest surface fires usually do not kill all trees, they severely damage forests. Logging companies in Amazonia kill or damage 10-40% of the living biomass of forests through the harvest process. Logging also increases forest flammability by reducing forest leaf canopy coverage by 14-50%, allowing sunlight to penetrate to the forest floor, where it dries out the organic debris created by the logging. ENSO-related drought can desiccate large areas of Amazonian forest, creating the potential for large-scale forest fires. Because of the severe drought of 1997 and 1998, we calculate that approximately 270,000 km2 of Amazonian forest had completely depleted plant-available water stored in the upper five metres of soil by the end of the 1998 dry season. In addition, 360,000 km2 of forest had less than 250mm of plant-available soil water left by this time (Fig. 1b). By comparison, only 28,000 km2 of forests in Roraima had depleted soil water to 5m depth at the peak of the Roraima forest fires. Thus, from an assertion (IPCC) that "up to 40% of the Amazonian forests could react drastically to even a slight reduction in precipitation", we see this relying on a statement (Rowell & Moore) that "up to 40% of the Brazilian forest is extremely sensitive to small reductions in the amount of rainfall." But that seems to rely solely on the assertion that: "Logging companies in Amazonia kill or damage 10-40% of the living biomass of forests through the harvest process." Turning this round and starting at the Nature end, we have "Logging companies in Amazonia kill or damage 10-40% of the living biomass of forests through the harvest process," turn into, "up to 40% of the Brazilian forest is extremely sensitive to small reductions in the amount of rainfall," which then becomes "up to 40% of the Amazonian forests could react drastically to even a slight reduction in precipitation". And that is what Jean-Pascal van Ypersele calls, "assessing the quality information about climate change issues in all its dimensions." Answering our own question as to why the IPCC authors did not use the peer-reviewed Nature reference rather than the secondary source, the reason now becomes clear. The paper simply did not support the assertion they wished to make. Here, context is everything. In the Nature paper, the authors are writing about the effects of logging on the rain forest. They describe how selective harvesting (as for mahogany, which is specifically identified) damages the forests so harvested, rendering the remaining trees more prone to effects of drought. Thus, increased sensitivity to reduced precipitation – should it occur – is a secondary effect, applicable only to already damaged forests. In that context, the 40 percent on which Rowell & Moore and then the IPCC rely relates not to an area of the Amazon rain forests but to the proportion of trees damaged in individual forest tracts, which have been harvested (and the top range of the estimate at that). It cannot be taken to refer to the totality of the Amazonian forest area. For an indication of the scale of the damage, we have only the estimates in the Nature paper that "approximately 270,000 km2 of Amazonian forest had completely depleted plant-available water stored in the upper five metres of soil by the end of the 1998 dry season," with an additional 360,000 km2 suffering reduced water availability – thereby rendering those trees more susceptible to drought. Three points emerge from this. Firstly, these combined areas relate to a total forest area of between 4-6 million square kilometres, and thus represent perhaps as little as ten percent of the total area. Secondly, the effects are observed in relation to severe drought effects arising from an unusually strong El Nino episode, unrelated to climate change. And thirdly, the drought effect is localised. In other areas of the forest, the El Nino brings increased rainfall. By any measure, and by any possible construction, the Nature paper cannot be taken to support the assertions made either by Rowell & Moore or the IPCC. As with the assertion on the Himalayan glaciers, the IPCC passage should be withdrawn.